Not treated by a vet with antibiotics, kennel cough can progress into life-threatening bronchopneumonia. Kennel cough, also known as bordetella, is a highly contagious bacterial disease that affects the upper respiratory tract and spreads quickly. While exposure to a few pathogens leaves dogs susceptible to contracting kennel cough, Bordetella bronchiseptica is the only pathgen that affects cats. Because kennel cough is a zoonotic disease, dogs and cats can pass it to one another and to humans. The bacteria that cause kennel cough pass as airborne particles when an infected dog sneezes or coughs. When an infected animal sneezes, surface areas become contaminated. Therefore, any dog or cat who comes in contact with a contaminated surface can contract kennel cough. It is called kennel cough because it often occurs in boarding facilities, animal shelters and large veterinary practices where there are many animals sharing one space. Cats and dogs kept in crowded or unhygienic spaces will be at a high risk for contracting kennel cough. Even clean spaces can be risky for animals if they are crowded, because if one animal has kennel cough he can spread it quickly to the rest of the animals. However, animals are likely to contract kennel cough in unhygienic spaces. Symptoms of kennel cough include excessive coughing and hacking, sneezing, fever, vomiting, and nasal and ocular discharge, although coughing is less frequently prevalent symptom in cats. Depending on the cat and his overall general health, his symptoms may range from mild to severe. Some cats who contract the disease might lose their appetite if their lymph nodes become enlarged. Kennel cough requires treatment with antibiotics, so take your cat to the veterinarian if he is presenting symptoms of kennel cough. All cats who come in contact with Bordetella bronchiseptica can contract kennel cough. However, some kittens and cats are especially susceptible. Very young kittens who contract the disease can die early as 12 hours after presenting the first symptoms. Cats with compromised immune systems because of leukemia or feline immunodeficiency virus are likelier to contract kennel cough as well. If your your young or already ill fur ball contracts kennel cough, get him to the veterinarian immediately. Some cats are chronic carriers of the bacteria that don't show any symptoms. Other cats will have nasal or ocular discharge for nearly a two-week period with some inconsistent coughing and sneezing. 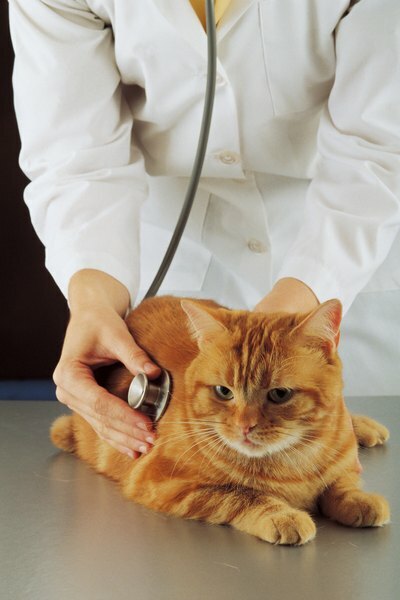 If left untreated, and in very young or already ill cats, kennel cough symptoms will be severe, and cats may develop life-threatening bronchopneumonia.